Roz Savage is yet another remarkable woman. I met Roz last year at the 2013 West Cork Literary Festival in Bantry, Co. Cork. The festival was great as was the weather, hot sunny days of clear blue skies and deep sparkling seas edged by green grass festooned with wild flowers. The evenings and nights remained balmy as people sat out on the main square and chatted after the days events and evening readings. The diminutive Ms Savage and I. I am tall, but Roz is wearing 4″ wedge sandals here which goes to prove it isn’t the body that dictates our capabilities but rather what we have in us, our innate gifts and desires to manifest our unique calling! Rowing the world’s oceans is a calling I am definitely not hearing! Roz was there talking about her adventures and promoting her book, which, unfortunately didn’t arrive in time for her to sign copies for interested purchasers. I had a word with her afterwards. She was glowing as she told me how grateful she is for the life she now lives. I told her “You made it happen, Roz.” She agreed that that was the case, told me it hadn’t been easy, had taken time to put in place, but that she feels so fortunate she took the measures she did to forge ahead to create the life she now lives. Roz grew up moving from musty old priory to musty old priory as a minister’s daughter. She swore that when she grew up, she would have a fabulous career, with a handsome husband and live in a big, fancy house. This came to pass and Roz worked as a management consultant, and her life was complete with the longed for husband and house. Except, she discovered she wasn’t actually that happy. At age 34, on a train trip, she completed two obituaries. Aghast at the discrepancies between the obituary resulting from continuing her course or altering it to a more longed for life, she realized she needed to take drastic action. Fast forward to Roz leaving her career and retraining to be a photographer – again this proved less than fulfilling. Possibly due to her upbringing in a spiritually oriented household – she began to look for a cause larger than herself. She began to become aware of her consumer habits and the lack of responsibility she had been taking around what happens when all of her (and her friends) purchases became unwanted and redundant. Where did all this STUFF go? Her growing awareness of environmental issues spurred her on to look for a platform that would allow her to make an impact in the field of environmental awareness. Having a background in rowing helped her to choose. 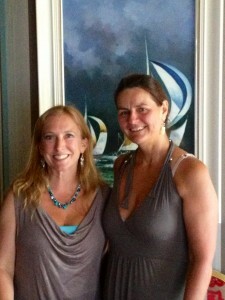 She would row solo across the Atlantic Ocean. In 2006 she completed the journey that was replete with drama: broken oars, broken cooking stove, radio, music player, satellite phone, and navigation equipment! She continued despite these enormous, and frightening, set backs reaching Antigua after 103 days on the open ocean and becoming only the 5th woman to row solo across the Atlantic from East to West. I remember her saying, while showing a clip of herself at sea reporting to her weblog that she was so physically uncomfortable, that she had then remembered: prior to the undertaking, she had been repeating over and over to herself, that she wanted to get out of her comfort zone – and her wish had been granted. She was living the life she had asked for and had no need of complaint no matter the discomfort. After this trip she wrote her second book (her first, Three Peaks In Peru had been written after she had spent three months travelling solo through Peru) Rowing The Atlantic – Lessons Learned On The Open Ocean, published in 2009. 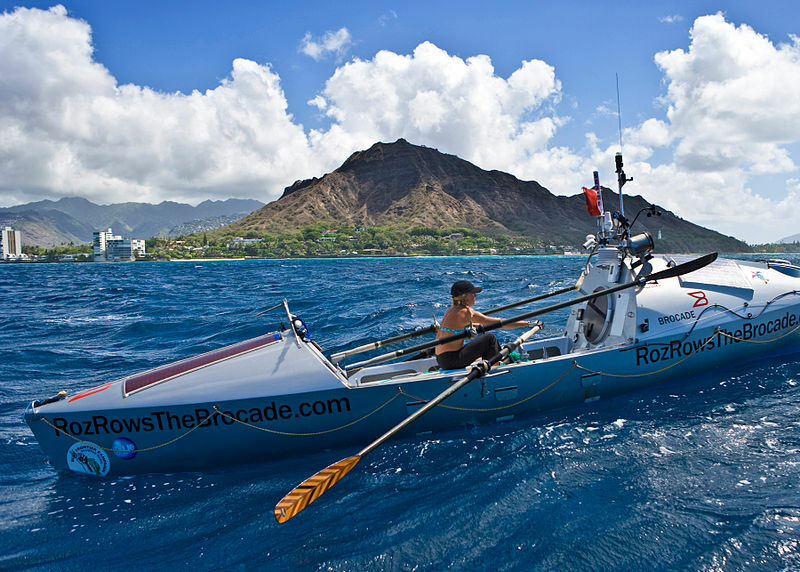 She then rowed The Pacific Ocean in three stages, setting off from California in 2008 and finishing in Papua New Guinea in 2010 (breaking the journey in the interim at Hawaii and Tuvalu in 2009). The next ocean Roz tackled was The Indian Ocean in 2011. This resulted in her having to be towed back to Australia from whence she had launched 4000 miles earlier due to her desalination machine breaking down. In October that year she completed the journey in 154 days. This made her the first woman to successfully row the Big Three Oceans: The Atlantic, Indian and Pacific. Her intention to row the North Atlantic the following year was thwarted due to an unusually high number of icebergs making the risks too high for herself and her intended Olympic Atlantic Row team partner Andrew Morris to undertake. Perhaps the most frightening incident of these huge and brave undertakings came when she lost an oar at sea. Despite having replacement oars, she didn’t want to add any rubbish to an already over polluted ocean and set out to swim to retrieve the oar, which she successfully did, only to realize to her absolute horror that the boat had drifted so far in the other direction she wouldn’t be able to reach it. As she swam and swam towards it, she almost gave up from exhaustion. Only a dream her mother had recounted to her and a subsequent promise she had made kept her going. Her mother had told Roz she had dreamed of Roz’s boat being found adrift and empty and Roz had promised her mother she would never allow that to happen, and now it almost came to pass. That promise to her mother gave her the strength and determination to carry on when she could have given up. I think it’s also necessary here to think of the courage of her mother and all mothers who allow their children to pursue their dreams unhindered despite their own fears for the safety of their beloved offspring. Not surprisingly, Roz Savage has since become an inspirational and motivational speaker and tells her story with great energy recounting real trials, dramas, mistakes, highlights and wisdom. I loved when she recounted her experience of finding herself floating above her recumbent form one calm evening on the open sea. She gazed down from above at herself asleep on the deck of the boat and realized then through direct experience that consciousness is not confined to physical form. Just one more reward for taking stock of life and rather than drifting along to society’s conditioning, to rather seize the oars, live ones authentic Self and relish the gift of life we all are.